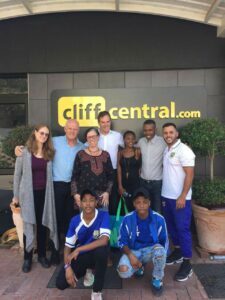 Empowervate Trust’s CEO, Amanda Blankfield-Koseff, was featured on Laws of Life with Garry Hertzberg on Cliff Central.com with a learner Katlego from Meadowlands in Soweto. Katlego used the Y-CAP methodology to create awareness about the dangers of sugar daddies in her school and community. This specific show was focused on the issue of street children since it was International Day for Street Children, and the two other groups in studio were a soccer club and theatre production who each assist street children through helping them discover their sports and musical or theatrical talents. Empowervate’s segment was a follow up on the topic of sugar daddies from the show we were on last year as well as adding some input to the general discussion in studio.